Ronald Reagan Washington National - El Salvador Intl. Washington Dulles Intl. - El Salvador Intl. If you were away the day your geography teacher told the class where Antiguo Cuscatlan is, don't fret. With the following helpful information, you'll find it on a map in no time! About 4 miles (6 kilometers) southwest of the center of San Salvador, this suburb is a wonderful place to experience the nation's capital like a local. There are around 550,000 locals that live in San Salvador. 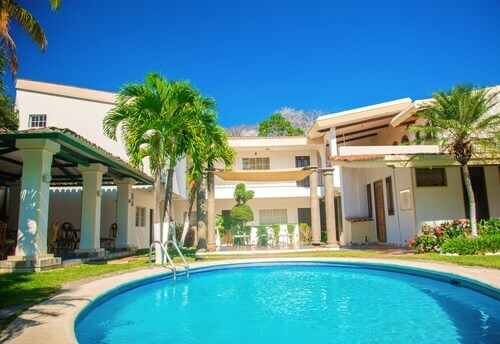 With at least 400 airlines and 665,000 places to stay, Travelocity can get you the cheapest prices on your Antiguo Cuscatlan escape. And how do we do that? We'll bundle your accommodations and flights to save you heaps! From accommodations and flights to car rentals and experiences, we can offer 24/7 personal assistance via our Customer 1st Guarantee. If you find a lower price on another site, we will reimburse the difference^. You've got the flexibility to alter any of your travel plans with no scary fees from us. You know what that means? Less for you to worry about. And so long as you get in fast, many accommodations don't charge fees either^. 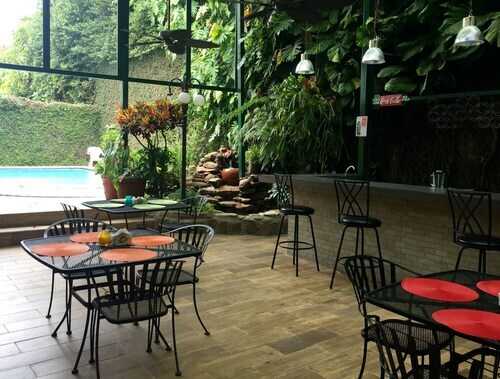 Headed to Antiguo Cuscatlan and eager to stay where all the action is? Travelocity is here to help. Pick from 6 accommodations which are just minutes from the middle of this unique neighborhood. 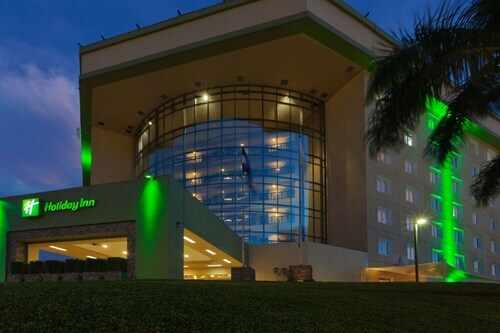 We recommend the Holiday Inn San Salvador (Urb. 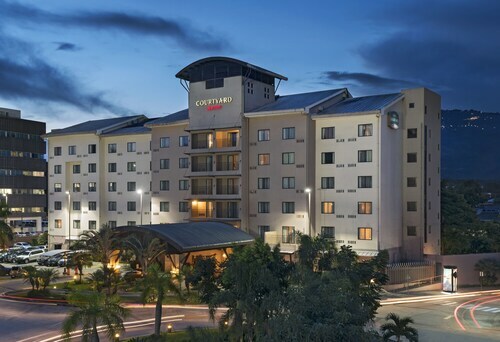 Y Blvd Santa Elena) and the Courtyard Marriott San Salvador (Esquina Calle 2 y calle 3). Pick out the best option and then start packing your suitcase. Where do you fly into for Antiguo Cuscatlan? Jump on the plane and get some sleep. Once the wheels hit the tarmac at El Salvador International Airport (SAL), you'll still have to travel 20 miles (32 kilometers) to reach the center of Antiguo Cuscatlan. Can I rent a car in Antiguo Cuscatlan? Grab a rental car via Travelocity for your time in Antiguo Cuscatlan. You're sure to encounter some beautiful sights while you're on the road. Picking up a car straight from El Salvador International Airport will ensure that you don't have the stress of cabs and transfers. You don't need to walk far to find Avis and Alamo Rent A Car. It's heartening to know that you can rent a car close to the heart of the city. At Av La Revolucion Col San Benito, Budget will get you behind the wheel in no time. If they don't have anything that ticks all your boxes, you can try Alamo Rent A Car at Boulevard Del Hipodromo, Y Avenida Las Magnolias. This handy rental outlet is only 2 miles (3 kilometers) from the center of town. Shopaholics rejoice — you'll be able to indulge in a little impulse buying at Multiplaza. Ready to exercise that bank card and buy up a storm? Want more nearby options? Shopaholics listen up — you'll be able to treat yourself to some retail therapy at La Gran Via Shopping Center. Ready to work your wallet and buy up a storm? But there's more. Take a good read, look for a cool grassy spot and enjoy the enticing garden air at La Laguna Botanical Garden. Visit Santa Tecla. You'll find it about 4 miles (6 kilometers) away. 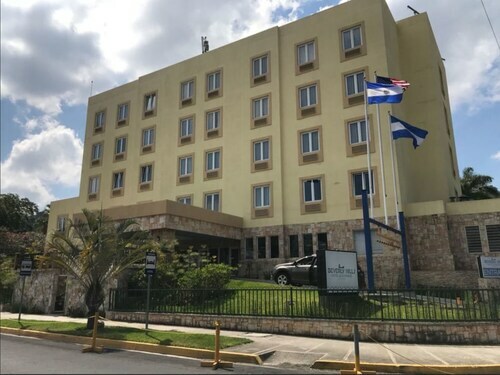 Situated in the business district, this hotel is 0.6 mi (0.9 km) from U.S. Embassy in San Salvador and within 3 mi (5 km) of Multiplaza and Plaza Merliot. Estadio Cuscatlan is 3.9 mi (6.2 km) away. 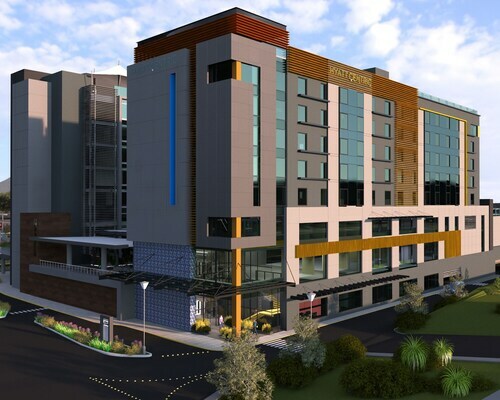 Situated in Antiguo Cuscatlan, this hotel is within 1 mi (2 km) of Las Cascadas Shopping Mall and La Gran Via Shopping Center. Plaza Merliot and Monumento al Salvador del Mundo are also within 3 mi (5 km). Situated in the entertainment district, this hotel is within 1 mi (2 km) of Las Cascadas Shopping Mall and La Gran Via Shopping Center. Plaza Merliot and Monumento al Salvador del Mundo are also within 3 mi (5 km). 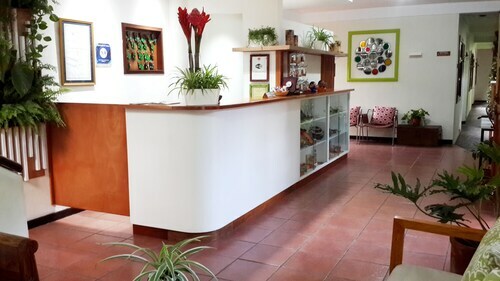 Located in the heart of Antiguo Cuscatlan, this hotel is 0.4 mi (0.7 km) from U.S. Embassy in San Salvador and 1.6 mi (2.6 km) from La Gran Via Shopping Center. La Laguna Botanical Garden and Las Cascadas Shopping Mall are also within 2 mi (3 km). Situated in Antiguo Cuscatlan, this hotel is 0.4 mi (0.7 km) from U.S. Embassy in San Salvador and 1.7 mi (2.8 km) from La Gran Via Shopping Center. La Laguna Botanical Garden and Las Cascadas Shopping Mall are also within 2 mi (3 km). 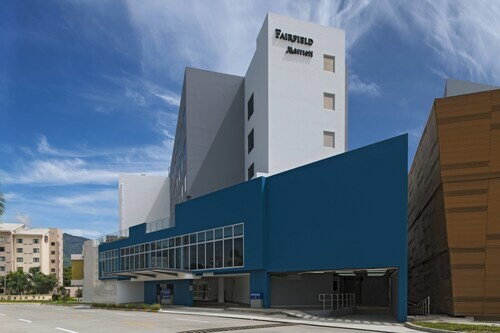 Situated in the business district, this hotel is within 1 mi (2 km) of Multiplaza, La Gran Via Shopping Center, and International Center for Fairs and Conventions. Bicentennial Park and Estadio Cuscatlan are also within 2 mi (3 km). Situated by the sea, this luxury hotel is within a 10-minute walk of Las Cascadas Shopping Mall and La Gran Via Shopping Center. Plaza Merliot and Monumento al Salvador del Mundo are also within 3 mi (5 km). Situated in Antiguo Cuscatlan, this bed & breakfast is within 1 mi (2 km) of Centro Monsenor Romero and La Gran Via Shopping Center. Monumento al Salvador del Mundo and Plaza Merliot are also within 3 mi (5 km).